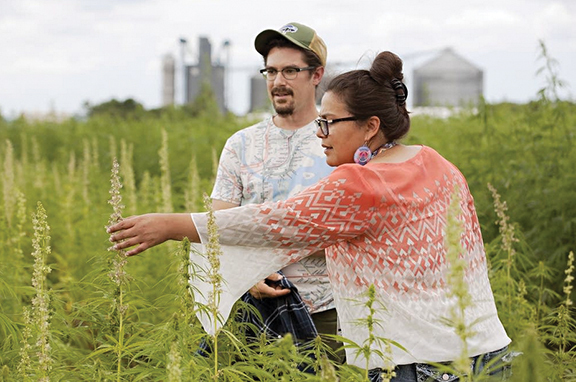 There’s a lot of expectation invested in a few acres of hemp growing on a hill overlooking the small town of Callaway on the edge of the White Earth Reservation. 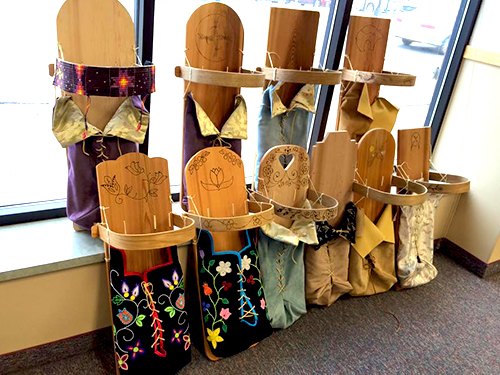 Mason is nervous because the tribe has nearly $100,000 invested in this project and because she sees so much potential for economic development on this remote reservation. Hemp is grown for seeds or fiber. The seeds and the oil produced by crushing the seeds are a growing part of the food market. It’s also genetically related to marijuana, a connection that’s made widespread legal production in the United States nearly impossible. While hemp plants hold only a small amount of THC, the compound that gives marijuana it’s narcotic effect, the federal government still considers hemp a controlled sub-stance, an illegal drug. Three years ago, Congress legalized industrial hemp for research purposes, but only under the watch of a university or a state agriculture department. Last year, the federal Drug Enforcement Agency gave the Minnesota Department of Agriculture permission to start a hemp pilot project without running afoul of federal drug laws. It required the hemp seed be imported under permits from the state Agriculture Department. Six participants grew 40 acres. This year, Minnesota ag officials received 42 applications for more than 2,000 acres. That included the tract at White Earth, which used seed imported from Canada and Europe. Although White Earth is a sovereign nation, tribal officials say they are following all state and federal regulations related to hemp. Weiblen is overseeing hemp variety trials around the state including on the White Earth Reservation where there are 12 varieties of hemp bred for seed production. 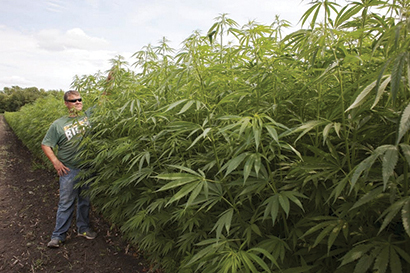 He’s certain hemp can be successfully grown across Minnesota. Processing requires mills to chop plant stocks and extract fibers, and squeeze oil from the seeds. White Earth is considering buying a press to crush seeds for hemp oil, but they see perhaps more potential in the taller, more robust plants growing next to the seed test plot. The hemp stalk has long fibers a bit like wool on the outside and a woody material inside. The long fibers are commonly used to make rope and fabric. Right now, most of that market demand is filled with cheap Chinese imports. And those long fibers are difficult to extract. “So we’re going to start with the easier products, the hempcrete, the fiber board,” said Paige. Hempcrete is concrete made with chopped-up hemp fibers. It’s lighter and stronger than traditional concrete. Fiber board combines wood chips and hemp in a plywood-like panel. The challenges of processing hemp have tribal officials cautious about the payoff from hemp, but they envision making construction materials and creating much needed jobs. Hemp also fits well with the White Earth Nation vision for sustainable food production, said food sovereignty coordinator Paige. These hemp plots have had no added fertilizer or pesticides so it would fit well with an organic crop rotation. “Edible beans, native corn, hemp, alfalfa. This kind of rotation is an organic rotation that would be profitable in a value added market,” said Paige. White Earth chair Terry Tibbetts says creating industry around hemp would be a good way for White Earth to use its limited resources. 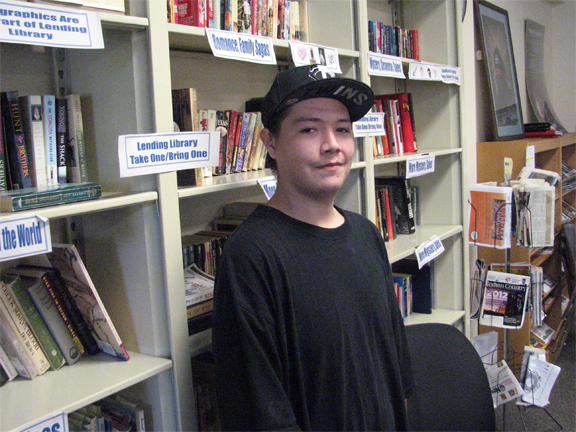 He says because land is a renewable resource the tribe can use it to build a sustainable economy.